A recollection of Elmo & Sonny's stint at Riker's Island ("The Rock"), this unusual composition has an interesting form and a driving rhythm. Three Clifford Brown trumpet solos available, each in both B-flat and C editions. Minus You tracks are also available for all instruments from the New Stories recording. 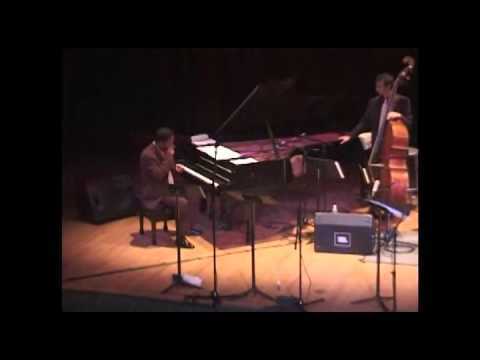 The Music of Elmo Hope: Mike Rodriguez, trumpet; Joe Lovano, tenor sax; Eric Reed, piano; Barak Mori, bass; Kenny Washington, drums; live from Miller Theater, Columbia University, NYC. Eric Reed, producer. 10/12/2001. Grant Stewart at Camion Jazz: Grant Stewart, tenor sax; Yves Brouqui, guitar; Nicolas Rageau, bass; Phil Stewart, drums. 2013. This album, the Lou Donaldson 10 inch Blue Note release, was the original release and contained only the master take. See the Clifford Brown Memorial album (click on the album cover) for two alternate takes. Our recording excerpt starts with the melody. The actual recording begins with an 8-measure drum set up. This composition has an interesting form that is used for the solo section as well. When you examine the lead sheet, you'll see that the last 12-measure section, which comes after the 8 measure bridge, is not a musical repeat of the melody from the beginning, as would be normal in an ABA form. Rather, the last section starts from the 5th measure of the opening melody. As a result, this 16-8-12 measure repeating form seems to just keep going, sounding like it never comes to a end. This album, the Lou Donaldson 10 inch Blue Note release, was the original release and contained only the master take track. "The Rock" was what musicians, and others, called Riker's Island, one of New York City's large jail facilities. Drug problems caused quite a few musicians to be detained at "The Rock." The only time Sonny Rollins recalls being detained at Riker's with Elmo was for a portion of 1950, so, if pressed, he feels Carvin' The Rock was written at that time. This would therefore be three years before the recording. There seems to be no word from Elmo as to when this composition was written. We are fortunate in that the audio for all three recorded takes is available, so you can examine the variations the musicians made from take to take. Clifford Brown's solo from each take is also available separately. Comparing solos from different takes of the same song can give you further valuable insights into the soloist. For more details about Elmo Hope's recordings, check out the Elmo Hope Discography on Noal Cohen's Jazz History website. Transcribed Trumpet Solos: The three Clifford Brown solos are available separately. Comparing solos from different takes of the same song can give you further insights into the soloist. For example, our audio teaser compares how Clifford starts each of his solos trumpet. For our excerpt, the start of each solo chorus is heard in the order they were originally recorded: alternate take 1 / master take / alternate take 2. You will immediately hear that Clifford had a way he wanted to start his solo. First (alt 1) he tried his opening phrase pattern in the lower octave. On the second take (which became the master take) he started with the same first-measure-notes up an octave, and then immediately went a different direction. At the end of the whole recording session, they decided they wanted to try one more take, which is now alternate take 2. That time, Clifford essentially played the first two measures the same as he did on the master take, with only a couple of minor alterations you'll see when you compare these two transcriptions. Then he headed off in a totally new direction. 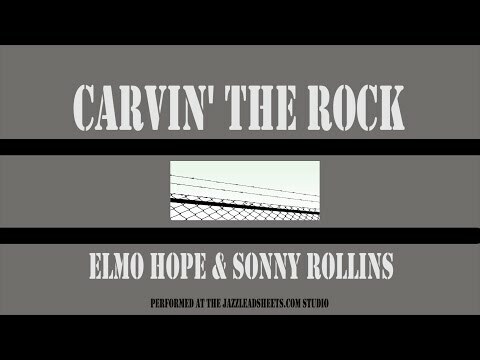 CARVIN' THE ROCK, written by Elmo Hope & Sonny Rollins, performed by Eric Borczuk, clarinet; Sam Glick, guitar; Ben Caine, piano; Greg Momjian, bass; and Cam Johnson, drums. Jazzleadsheets.com studio, May 3, 2015. This album, released after Clifford Brown's death, contains the master take and two alternate takes. The master take originally came out on the Lou Donaldson 78rpm issue BN 1624 and had De-Dah on the flip side. It was then released on the 10-inch LP BN 5030. The CLIFFORD BROWN MEMORIAL ALBUM contains all the solos takes recorded. Transcribed Trumpet Solos: The three Clifford Brown solos are available separately. Comparing solos from different takes of the same song can give you further insights into the soloist. Our audio teaser compares how Clifford starts each of his solos. For our excerpt, the start of each solo chorus is heard in the order they were originally recorded: alternate take 1 / master take / alternate take 2 clip. You'll immediately hear that Clifford had a way he wanted to start his solo. First (alt 1) he tried his opening phrase pattern in the lower octave. On the second take (which became the master take) he started with the same first-measure-notes up an octave, and then immediately went a different direction. At the end of the whole recording session, they decided they wanted to try one more take, which is now alternate take 2. That time, Clifford essentially played the first two measures the same as he did on the master take, with only a couple of minor alterations you'll see when you compare these two transcriptions. Then he headed off in a totally new direction. This version of Carvin' The Rock is slower than the original recording. There is no drum intro; the track starts right on the melody. Unlike the original version, in which the piano takes over the melody on the bridge, on this recording saxophonist Bobby Porcelli plays the entire in head. The B section of the out head has a piano solo. Our lead sheets and rhythm section parts show all the rhythm section activity on the head. Minus You tracks are also available for all instruments; click on the Minus You tab for more details. Parts labeled (minus you) are the basic lead sheets and also the Minus You parts. Tracks labeled (practice) have fewer choruses and would be great for auditions. Tracks labeled (performance) have more solo choruses. The New Stories trio, a Seattle-based group, took a few weeks off their regular lives to work on Second Floor Music/jazzleadsheets.com music at Rudy Van Gelder's Englewood Cliffs, New Jersey, studio. They had immersed themselves in Elmo Hope music in preparation, and when they met saxophonist Bobby Porcelli in the studio, magic happened. The magic continued after the musicians went home and we discovered the tracks were suitable for Minus You tracks. Click the Minus You tab for details. Separate melody and rhythm section parts are available under LEADSHEETS. Any melody part can be used with any minus melody track as well as the trio (bass & drums only) tracks. The Piano part is for any harmonic instrument (Piano, Guitar, Vibes, etc.) and can also be used with either the MP3 minus piano track or the trio (bass & drums only) tracks. Because the form is divided into 16-, 8-, and 12-measure sections, in the chorus of trading 8s the last drum solo section is 12 measures long. mp3 minus Piano The Piano part can also be used with the MP3 trio (bass & drums only) tracks.